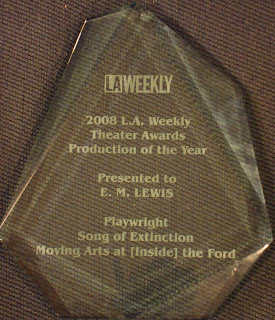 "Moving Arts at Inside the Ford’s production of EM Lewis’ “Song of Extinction,” a drama exploring the delicate relationship between an alienated high school biology teacher who carries the burden of being a Cambodian refugee who survived the killing fields and his troubled student, has won the LA Weekly Theater Award for production of the year for 2008. 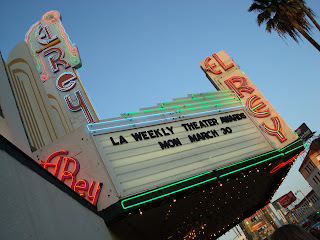 The annual awards were presented Monday night at the El Rey Theatre." And Darrell Kunitomi, who played the Cambodian biology teacher Khim Phan, won for Best Leading Male Performance. What an amazing night! We were all amazed. I'm still amazed. Thanks, LA Weekly people. It means a lot. Thank you Song of Extinction people. You believed in my little play, and you brought it to life. On Sunday, March 29th, the year-long War Plays Project had it's culminating event -- a presentation of work by local playwrights at the beautiful Lyric Hyperion Theater in Silver Lake. A great time was had by all! It’s been six years since the beginning of the war in Iraq. The world has changed... and so have we. Join local playwrights as they present original pieces that represent their impressions and thoughts about the war. 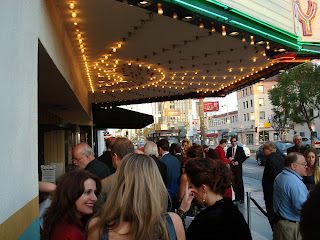 Producers, playwrights, actors and friends mingled after the presentation of work. Thanks to all who participated! I think plays and poetry are more akin to each other than to other writerly arts. They don't look similar at first glance. One is short, and meant to be read and pondered, maybe out loud, but maybe not. The other is often longer, meant to be performed... Poems are most often a single voice, plays are most often a concert of voices. Poems have a narrative voice (sometimes), plays have a narrative voice seldom. 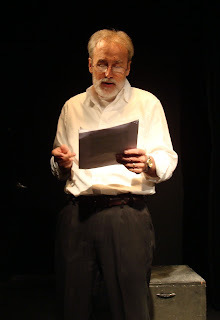 Both plays and poetry have a particular appreciation of the sounds of words. At their best, there is something spare and specific about them -- even in the voluptuous words of Tennessee Williams or August Wilson, it feels like not a word is wasted, and you can't help but read their words out loud, they are irresistible to the tongue. I also feel like there is a similar sense of surprise and free association in a good play and a good poem -- a shock that we've gone from here to there in an instant, but... why not? Each is in the moment. Now. Anything can happen. Photojournalism -- Art or News? Interesting article here about whether Photojournalism is Art (with a capital "A") or not. I thought about photojournalists a lot while writing Heads, which has one as a character. I researched them, read some of their books, and saw a bunch of them in person at the World Photo Tour, which comes to the Annenberg School of Communication here at USC annually. They do take thousands and thousands of pictures. But then they pick a few to send in to editors. And then (hopefully), the editor's will choose one or two, from all the photojournalists who are sending stuff, to publish in their newspapers and magazines. And you can't discount the photo spread and photo book, either. That's part of a photojournalist's work. Newspapers may be all about the single shot, but a number of magazines will print a series of photos that tell a story. When you look at a photo book, you can really see the artistry involved. Photojournalists are storytellers. Journalists are storytellers. They are framing the truth for us as accurately as they can. The worst of them are junk dealers. The best of them? I think they're artists. Book recommendation of the day: Requiem, edited by Tim Page. 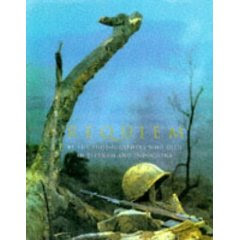 It's a beautifully put together photo book that charts the progress of the Vietnam War through the earliest days until the bitter end. All photos were taken by photojournalists either killed or MIA during the war, and the book tells the story of their lives and dedication along with telling the story of the war. Seems like art to me. PS: I do appreciate the attitude of the photojournalist in the article. Or "wire guy," as he calls himself. He seems very down to earth. 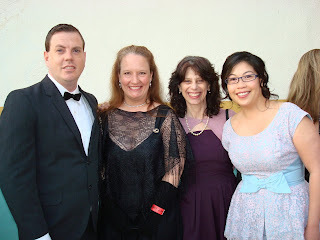 I went to the Los Angeles Drama Critics Circle Awards last night at the El Portal Theater in North Hollywood. It was a lovely night. Many awards were given. Many speeches were given. I drank a glass of champagne, talked with lots of theater friends and enjoyed it all. 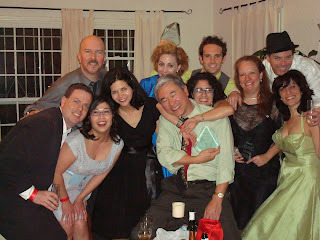 I was there to receive the Ted Schmitt Award for the world premiere of an outstanding new play, for Song of Extinction. Thank you, LADCC! At the Los Angeles Drama Critics Circle Awards at the El Portal Theater in North Hollywood, March 16, 2009. Song of Extinction director Heidi Helen Davis, playwright EM Lewis and Moving Arts managing director Steve Lozier. But... How do you feel? If you've seen Star Trek IV: The Voyage Home, I'm sure you remember the whales. But before the whales, there was the part where Spock, who is recovering from... well, being dead... has been undergoing some retraining, and is taking a test to make sure everything is back where it's supposed to be in his head. He does quite well on the test, answering question after question -- chemistry, math, physics -- until he reaches the last one. A trick question if ever I saw one. "How do you feel?" Well... He'd come back from an attempt at emotion-cleansing on Vulcan to save Earth in the first movie (mind-melding with a dangerous and lonely alien entity in the process), died of radiation poisoning in the second movie while saving the Enterprise and his beloved shipmates, and come back to life and been reconnected with his "katra" in the third movie, as the universe was saved from certain destruction, but the Enterprise met a fiery end, sacrificed to save its crew. At the moment, everything's good. He's hanging out with his folks, and getting ready to head out in an appropriated ship with all his old friends. He seems to remember math and physics. He's got his soul back. The universe is once again in jeopardy from a whale-singing alien probe, but he doesn't know that yet. Everything's good. Everything's good. But I don't blame him for not being able to come up with an answer. What is this apropos of, you might ask? I don't know. But it was on my mind. ...I'm trying to read a new poem. I've started with Mary Oliver, as I like her poetry enormously and have several of her books on my shelf. It's a much better way to begin the day than with the news, let me tell you. Today, I also tasted a new fruit. Well, new to me. 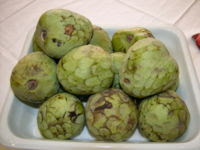 At the farmers market on Saturday, I bought a cherimoya. I asked the lady how to eat it, and she said to wait until it's soft, like an avocado, then cut it open and spoon out the white part. And that there would be black seeds inside. It was soft today, so I ate it. It was GRAND. Creamy, but a little bit tart... I'm so glad there are delightful things out there that I've never tried, and never even heard of! It is good to look at the world with the eyes of an Explorer. I rather like this article by blogger David Jays. Smell-O-Theaterama. You are THERE. He mentions the scents of toast and thyme and blood... I have to admit, the last time I smelled something at a play, it was the actors sweating through their shirts in a claustrophobic black box theater... but it was good clean sweat, well-earned through hard work, and I didn't mind it. I draw the line at spit, though. ...from my friend, playwright Stephanie Alison Walker. She and her husband, Bob, have been caught in the economic downturn -- but are boldly moving forward through the world together despite everything. She's a brave writer, and I admire the heck out of her. Check out Love in the Time of Foreclosure here. I was lucky enough to see Black Watch, a play developed and produced by the National Theatre of Scotland, a year or so ago with my friend Julie at UCLA Live. It's just won four Laurence Olivier Awards – the most for any single production -- in London. Deservedly so, I believe. If you know me, you know I have a certain interest in war stories. I've read quite a number of personal accounts from the Vietnam War (my favorite being Dispatches by Michael Herr). I've also written about the Iraq War, in my plays Reveille and Heads. Black Watch is a war story about a Scottish regiment that was disbanded just as its soldiers were about to be sent into the killing zone around the city of Fallujah in 2004. Writer Gregory Burke spent weeks with veterans of the operation, and from their words crafted this story about loss. That's what I think it's about, anyway. They have a proud tradition -- generations of their families having served proudly in this regiment, which is distinctly Scottish, down to the Black Watch pattern kilts they used to wear before everyone switched to camos. Disbanding the regiment is taking that history from them, just as this war, with its questionable motivations and goals, is taking their sureness from them. And how can you be a soldier without a certain amount of sureness and pride and tradition? The story is told in scenes and songs, pyrotechnics and choreographed fight/dance scenes. It's both violent and tender. The scene that has stuck with me most strongly was where one of the men received a letter from home. He opened the envelope, took out the letter, then let it flutter to the ground as he began to sign the contents of it. Another man got his mail, and he also opened the envelope, took out the letter, let it flutter to the ground, then began to sign the contents of his letter. And then another. And then they were all arranged across the great space, "reading" their letters with their hands, and I had a great lump in my throat at this beautiful, amazing manifestation of their emotions. So congratulations to the Black Watch folks. And also a plug for UCLA Live -- it's a wonderful series, international and interdisciplinary, and I've seen such fascinating stuff there! It's well-curated and consistently thought-provoking. Splurge for a ticket some time. Be provoked. I arrived at work this morning to find a lovely bit of good news in my e-mail inbox. 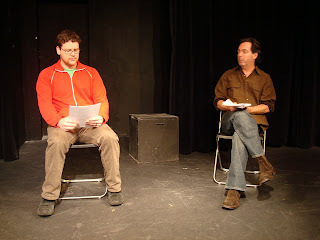 Apparently, I'm one of six finalists for the 2009 Harold and Mimi Steinberg/ATCA New Play Award, which recognizes the "best new scripts produced professionally outside New York City" in the previous year. The award finalists and winners are selected by the American Theater Critics Association -- the same folks who awarded me the Francesca Primus Prize for an emerging woman theater artist last year. I'm also a fan of several of the other finalists. In fact, I'm feeling entirely humbled to even be on a list with them. I studied Lee Blessing's play "A Walk in the Woods" in college. I LOVED Tracy Letts' "August: Osage County" when I saw it on Broadway (Broadway!) last year, just before it won a Pulitzer Prize. And one of my fav local theater companies, Furious in Pasadena, did a play called "Back of the Throat" by Yussef El Guindi two years ago which I think was my favorite thing I've seen there -- a war play (of sorts) with great punch, complication, boldness and truth. Some very good company. A very good day. 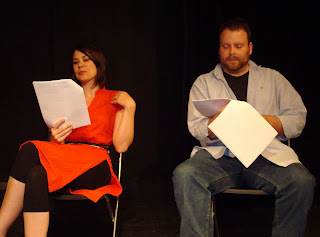 The American Theatre Critics Association (ATCA) has selected six finalists for the 2009 Harold and Mimi Steinberg/ATCA New Play Award, which recognizes the best new scripts produced professionally outside New York City during 2008. The winner and two additional citations will be presented April 4 at Actors Theatre of Louisville during the Humana Festival of New American Plays. The top award includes a commemorative plaque and a cash prize of $25,000 -- currently the largest national new play award -- with $7,500 for each citation. * Becky's New Car by Steven Dietz is "a warmly humorous and nimble romantic farce a genial consideration of loves lost and found, midlife and middle-class ennui and American car lust," said the Seattle Times. It was produced in October 2008 by ACT Theatre in Seattle. * Great Falls by Lee Blessing is a wry drama about a stepfather and his disaffected stepdaughter trying to make connections on a road trip across the American West. 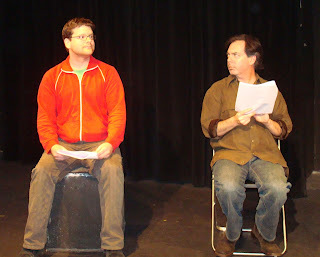 It was produced in February 2008 at the Humana Festival of New American Plays at Actors Theatre of Louisville. Blessing won the award in 2006 for A Body of Water and 1987 for A Walk in the Woods. * Lydia by Octavio Solis is a searing depiction of a dysfunctional Mexican-American family in the 1970s dealing with issues of immigration, assimilation and mental illness. It premiered at the Denver Center Theatre Company in January 2008. * Our Enemies: Lively Scenes of Love and Combat by Yussef El Guindi depicts Muslim-Americans struggling among themselves how to portray their cultural identity and how deeply to assimilate in the post-9/11 world. It was produced in March 2008 by Silk Road Theatre Project in Chicago. * Song of Extinction by E.M. Lewis starts as a realistic examination of ecology, genocide, isolation, music, family relationships and a host of other issues but morphs into a dreamscape which weaves the disparate strands into a cohesive pattern of inter-connectedness. 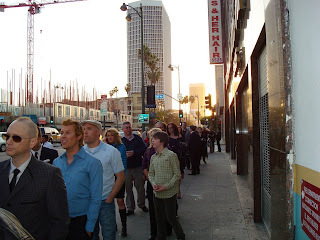 It premiered in November 2008 at Moving Arts in Hollywood. Lewis won ATCA's Francesca Primus Award last year. * Superior Donuts by Tracy Letts is a comic drama portraying the resurrection of a former '60s radical who is hiding from disappointments and tragedies by running a tiny Chicago doughnut shop. His isolation is challenged by a young black man seeking a job and running from some secrets of his own. It premiered in June at Steppenwolf Theater. Consideration for the Steinberg/ATCA awards is limited to new plays not yet produced in New York City by the end of the year. These six finalists were selected from plays nominated by ATCA members, then evaluated by a committee of 13 theater critics, led by chairman Wm. F. Hirschman of the South Florida Sun-Sentinel. Other committee members are Misha Berson, Seattle Times; Bruce Burgun, Bloomington Herald Times and Back Stage; Michael Elkin, Jewish Exponent (Pa.); Jay Handelman, Sarasota Herald-Tribune; Pam Harbaugh, Florida Today (Melbourne); Leonard Jacobs, New York Press, Back Stage and The Clyde Fitch Report; Chad Jones, Oakland (Cal.) Tribune; Elizabeth Keill, Independent Press (Morristown, NJ); Elizabeth Maupin, Orlando Sentinel; Wendy Parker, The Village Mill (Midlothian, Va.); Michael Sander, Back Stage (Minn.); and Herb Simpson, Totaltheater.com (Rochester, NY). "This year's entries dig deep into the soul of America with timely issues about technology's effect on humanity and timeless issues about searching for meaningful human connections," Hirschman said. "The nominated plays reflect an encouraging range of well-known names and newcomers, young voices and mature talents, the mainstream drama and the surreal. Protagonists are as diverse as Arab-Americans fighting about their image or Southern white women planning a wedding to an African American runner from Louisiana." These awards began in 1977, when ATCA started to cite each year one new play produced outside New York City. In 1985, the annual citations expanded to three, and from 1986 one of those three was given the ATCA New Play Award of $1,000, with various newspapers providing financial subsidy. In 2000, the award was renamed to recognize the Steinberg Foundations generous annual gift of $15,000, raised in 2006 to $40,000. Honorees since 1977 have included Lanford Wilson, Marsha Norman, August Wilson, Jane Martin, Arthur Miller, Mac Wellman, Adrienne Kennedy, Donald Margulies, Lynn Nottage, Horton Foote and Craig Lucas. Last year's winner was Moises Kaufman for 33 Variations. Each year's honorees are chronicled in The Best Plays Theater Yearbook, edited by Jeffrey Eric Jenkins, alongside the 10 best plays produced that year in New York City. For a complete list of the 80 plays cited from 1977 through 2008, go to www.americantheatrecritics.org, under Awards. The Harold and Mimi Steinberg Charitable Trust was created in 1986 by Harold Steinberg on behalf of himself and his late wife. Pursuing its primary mission to support the American theater, it has provided millions of dollars to support new productions of American plays and educational programs for those who may not ordinarily experience live theater. ATCA was founded in 1974 and works to raise critical standards and public awareness of critics' functions and responsibilities and to recognize excellence in the American theater. The only national association of professional theater critics, with several hundred members working for newspapers, magazines, radio and television stations and websites, ATCA is the U.S. national section of the International Association of Theatre Critics, a UNESCO-affiliated organization that sponsors seminars and congresses worldwide. ATCA also presents the M. Elizabeth Osborn Award, honoring emerging playwrights, and the $10,000 Francesca Primus Prize, funded by the Francesca Ronnie Primus Foundation, honoring outstanding contributions to the American theater by a female artist who has not yet achieved national prominence. Annually it makes a recommendation for the Regional Theater Tony Award, presented by the American Theatre Wing/Broadway League, and its members vote on inductions into the Theater Hall of Fame. For more information on ATCA, visit www.americantheatrecritics.org . For more information on the Steinberg/ATCA Award, contact Christopher Rawson, chair of ATCA's Executive Committee, at crawson@post-gazette.com (412-216-1944), or Wm. 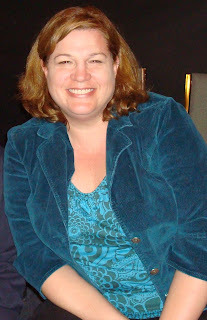 F. Hirschman, chair of the ATCA New Play Committee, at muckrayk@aol.com (954-478-1123). ...watching my cat dream. Listening to the heater hum. Cozy behind new curtains, which I hung in the front window. Joe is sacked out on the back of the couch, beside me. What's going through his little head? His whiskers twitch. His lips move. There is more I should have done this weekend, and too much to do this week. But this moment, right now, this instant? ...seem to be movie night. 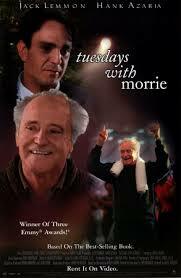 Last night we took to the couch, cracked open a beer (well, I did) and watched "Tuesdays with Morrie," which had come in my NetFlix cue. I started crying about five minutes in, and continued intermittently throughout. It's Jack Lemmon and Hank Azaria, in a story about sportswriter Mitch Albom's visits back to his old teacher, after finding out that his teacher had ALS (Lou Gehrig's Disease). It's about how to die, and how to live. And I found it more moving than I care to admit. But here I go, admitting it. Things are busy, busy, busy. As always! It's a good thing. On Saturday, I went to the last session in the current 8-week "semester" of Lee Wochner's "Words That Speak" playwriting workshop. I always appreciate Lee's ability to lead a workshop that helps all the participants be their best writing selves -- smart discussion, strong criticism, and lots of support. He has been a great teacher, mentor and friend to me. And I've met so many great people in his workshop. Fabulous writers! I need to write him a letter, an actual put-it-in-the-mailbox-with-a-stamp letter telling him how much he's done for me. Now it's time for me to start putting together readings for our group. Speaking of fabulous writers I met in Lee's workshop... 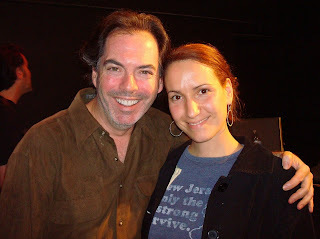 I went to a reading of Stephanie Walker's The Art of Disappearing last night, at the Blank's Living Room Series. It's a lovely play -- and was well-directed by an Oregon Shakespeare Festival fellow and beautifully acted as well. Stephanie had a full house of supportive people in the audience, and she deserved it. She's a great playwright -- and it doesn't surprise me at all that she's doing great things. On Sunday, I finished a new draft of the screenplay of Infinite Black Suitcase and sent it off to Jeremy to give to his manager, who apparently packages people for the making of indie films. I have no idea where this will go... but nothing ventured, nothing gained!